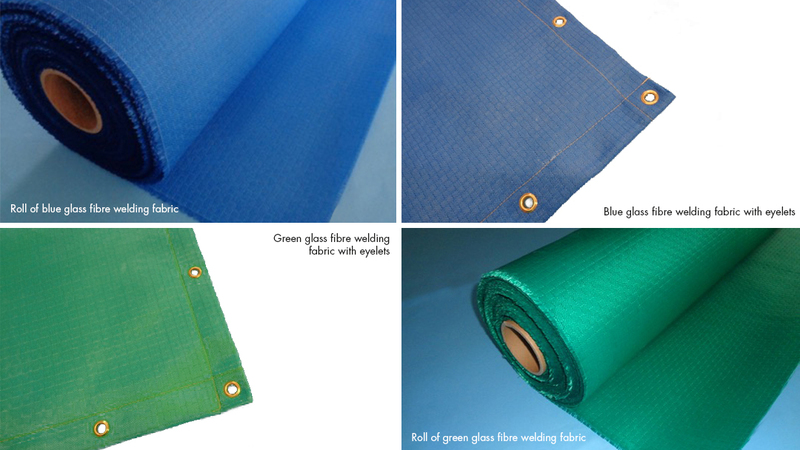 Blue and green welding fabrics are designed to reduce the incidence of glare. The weavelocked continuous filament glass fibre fabric has been passed through a special chemical finishing process. This gives weave stability and resistance to fray. Components with a low melting point are removed from the E-glass filaments, thus increasing heat resistance. These blue and green welding fabrics are suited for use in light duty welding operations. They can also be used as fire curtains/barriers, cavity wall barriers and other similar applications. When working with welding equipment, safety and protection is of paramount importance. The weavelock solution disperses at approximately 150°C. Once this has occurred, the base glass fibre fabric remains in place and is effective up to 550°C. Blue and green welding fabrics are available in standard roll form. This is providing that this is suitable for your own particular end use. For more information on our blue and green welding fabrics, please contact us today!